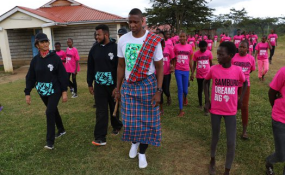 Toronto Raptors president Masai Ujiri with the girls at the Samburu Girls Foundation during his visit on August 19, 2018. Toronto Raptors president Masai Ujiri says he's committed to improving the standards of sports in Kenya. The Nigerian sports administrator whose mother is Kenyan, heads the popular Canadian team which competes in the popular National Basketball Association (NBA) league in the USA. The 48-year-old spoke to Nation Sport earlier this week during a tour of the Samburu Girls Foundation in the County. "We have a duty to empower and help Kenyans identify and develop their talents and give them hope," he said. "I am an example. I left Nigeria to play basketball in the USA and many other Kenyans and Africans can take this route too. They only require mentorship and professional advice to realise their dreams." Ujiri, who became the first non-American to win the prestigious NBA Executive of the Year award in 2013, was accompanied on this trip by members of his Giants of Africa Foundation (GFA). The GFA team is touring the continent on a mission to empower the youth and women. It has so far toured Uganda, Ghana, Rwanda and Kenya, where Ujiri promised to construct a Sh3 million bore hole at the institution based in Samburu, which houses 300 underprivileged girls. The team also toured Lokichar and conducted coaching sessions with the youth. "This support is vital, our girls risk their lives to go fetch water which is not clean. We require sustainable water to be able to practice farming," said Jeremiah Kipainoi, the Samburu Foundation's communications manager. Samburu Girls Foundation was set up by Dr Josephine Kulea in 2011 with aim of rescuing young girls from early marriages. The institution is currently home to 300 girls aged between 8-19, a majority of whom are in school including a 17-year old Josephine and her six-year-old daughter Florence. Under Ujiri's guidance, Raptors finished top of the 2017/2018 NBA Eastern Conference league before losing to Cleveland Cavaliers in the Eastern Conference semi-finals. Established in 1955, the club is currently worth an estimated Sh14 billion and also boasts international stars such as Kahwi Leonard and Kyle Lowry, who were each bought for about Sh2 billion.